2016 was another great year for anthologies. I haven’t read them all of course — not even close — but some of my favorites so far include Things From Outer Space, edited by Hank Davis, What the #@&% Is That? by John Joseph Adams and Douglas Cohen, Bridging Infinity, from Jonathan Strahan, Women of Futures Past, edited by Kristine Kathryn Rusch, and Drowned Worlds, also from the mighty Jonathan Strahan. Not to mention the various Best of the Year volumes, of course. 2016 is already looking pretty jammed packed with great anthologies as well. 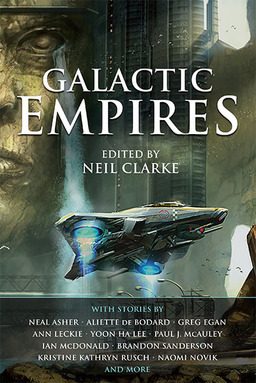 But the first must-read anthology of the year, no question, is Neil Clarke’s Galactic Empires, an ambitious (read: huge) collection of SF tales featuring far-flung confederations in the stars. The TOC is a who’s-who of virtually everyone doing important work at short length in science fiction, including Paul J. McAuley, Ann Leckie, Brandon Sanderson, Greg Egan, Aliette de Bodard, Neal Asher, Yoon Ha Lee, Tobias S. Buckell, Robert Silverberg, Kristine Kathryn Rusch, Robert Reed, Melinda M. Snodgrass, Naomi Novik, Ian McDonald and many others. 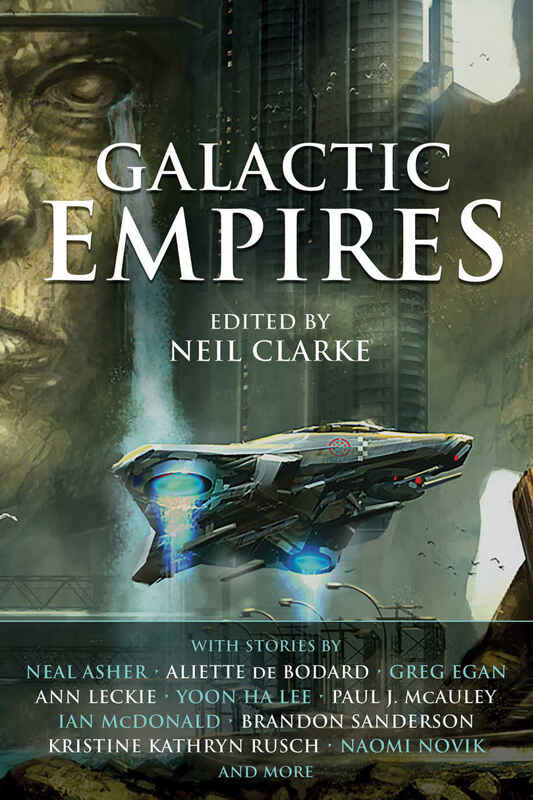 Galactic Empires will be published in trade paperback and digital formats by Night Shade Books next month. Here’s the description. From E. E. “Doc” Smith’s Lensman, to George Lucas’ Star Wars, the politics and process of Empire have been a major subject of science fiction’s galaxy-spanning fictions. The idiom of the Galactic Empire allows science fiction writers to ask (and answer) questions that are shorn of contemporary political ideologies and allegiances. This simple narrative slight of hand allows readers and writers to see questions and answers from new and different perspectives. The stories in this book do just that. What social, political, and economic issues do the organizing structure of “empire” address? Often the size, shape, and fates of empires are determined not only by individuals, but by geography, natural forces, and technology. As the speed of travel and rates of effective communication increase, so too does the size and reach of an Imperial bureaucracy. Note that Gardner Dozois edited a collection with the same title for the Science Fiction Book Club back in 2008 (we covered that one here). It’s a popular title; we don’t judge. Here’s the complete table of contents for Neil’s volume. Plus our regular monthly coverage of his magazine Clarkesworld, of course. Galactic Empires will be published by Night Shade Books on January 3, 2017. It is 630 pages, priced at $17.99 in trade paperback and $11.99 in digital formats. The cover is by Toni Justamante Jacobs. See all our recent coverage of the best upcoming fantasy and science fiction here. Might need to get that. Yeah, I thought of the Aldiss volumes first, actually, but didn’t think anyone would remember them! Should have known you’d show me up, Joe. Those Aldiss anthologies – Galactic Empires, Perilous Planets, Evil Earths, Space Odysseys – are still some of the best collections that anyone has ever put together. I have most, if not all, of the Aldiss anthologies. I should go back and read them at some point — the only ones I know for certain that I read were Galactic Empires 1 & 2 and Space Opera (which wasn’t part of that series, technically, but which certainly fit in thematically). Definitely worth a Vintage Treasures post, for sure. I would happily read such a post!